It is the use of closing losses by parts that allows you to reduce losses with a smaller deposit load, which ensures a safer operation with losses, in contrast to the grid strategies of closing orders only in whole groups. The Expert Advisor closes all profitable orders processed in order to cover a part of unprofitable orders using their profit and reduce the total position volume (optional). Then, by opening the renewing orders, it proceeds to reduce the loss by partially closing the loss-making orders. In case of partial closure, the algorithm restores the orders that are least well arranged first; each of the unprofitable orders is divided into many parts, each of which is closed separately by the adviser. Restoring orders are opened with a small volume in order not to significantly increase the load on the deposit. More information about setting up an advisor you can find here. 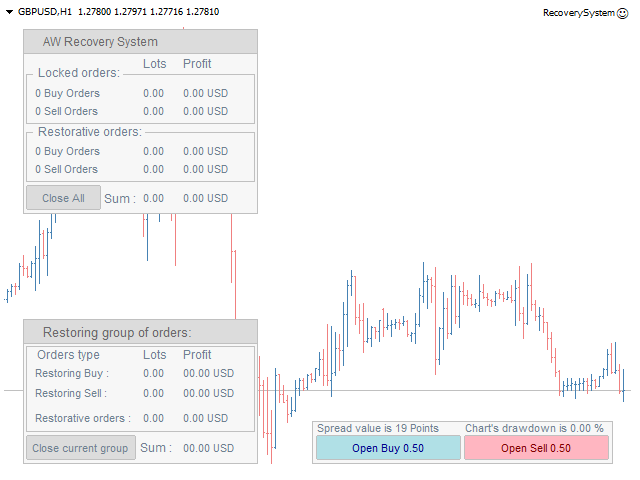 All_Trades - Advisor will work with all orders of the instrument. Work_at_Start - Advisor will start its work as soon as it is launched. Trend_Filter_Grids - Select an additional trend filter for restoring orders. In the previous version of the adviser there was a bug, due to which an advisor could be looped, please update the product.